32 years, 7 months, 3 days old age. Ravichandran Ashwin will turn 33 on 17 September, 2019. Only 4 months, 27 days, 22 hours, 12 minutes has left for his next birthday. Ravichandran Ashwin has celebrated the total number of 32 birthdays till date. See the analysis by days count and bar graph. 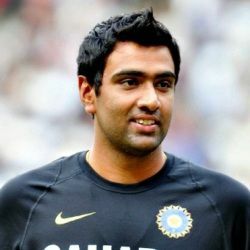 Ravichandran Ashwin was born on 17-09-1986 in Chennai in the state of Tamil Nadu, India. He is an Indian Cricket Player. Ravichandran is a famous Indian international cricketer and an all-rounder ( right-handed batsman and right-arm off bowler) from Team India. He went to St. Bede's and Padma Seshadri Bala Bhavan School. He completed his graduation in Bachelor’s of Technology in Information Technology from SSN College of Engineering. He used to play at junior-level cricket as an opening batsman but later turned out to be a bowler. He played for Tamil Nadu in 2006 and was selected as a captain for that team in next year. He came into limelight when he was picked by Chennai Super Kings in2010. His excellent economy rate and his performance in this limited over game brought him to audience’s notice. He was picked in Zimbabwe tour in 2010 and he made his debut in ODI cricket in 2010 against Sri Lanka. After a week he made his T20 international debut at Harare against Zimbabwe. He was dropped from playing 11 in tri-series and then later picked for ODI series against Australia. He was a lead wicket taker bowler in home series against New Zealand in 2010. He bowled in 2011 World cup. He performed excellently during a tour to England as well as England’s tour in India in 2011. He made his test cricket debut at Delhi and got his cap from Sachin Tendulkar. He also received the man of the match in the same match. He had a bad form for some time but he came back to form in-home test series against New Zealand. He was part of the squad for 2012 ICC World Twenty20. He worked along with Sunil Subramaniam (His and childhood coach and former Tamil Nadu spinner) for making positive changes in his bowling. He was highly successful in Australia's 2013 Test tour to India. He played in 2013 ICC Champions Trophy and in 2017 ICC Champions Trophy as well. With the emergence of Yuzvendra Chahal and Kuldeep Yadav, he was dropped from the ODI side. He though is the first choice spinner for India in Tests. He is also leading his IPL side Kings XI Punjab since 2018. Ravichandran Ashwin was born in a Tamil Family to Ravichandran (Employee of Southern Railways, and club cricketer) and Chitra. He married his friend from childhood, Prithi Narayanan in 2011 and the couple is blessed with two daughters named ‘Akhira’ and ‘Aadhya’. His actual name is only ‘Ashwin’ and ‘Ravichandran’ is his father’s name. His father was also a fast bowler but it was his mother’s advice for Ashwin to go for spin bowling. He used to open batting when he started playing cricket. This helps him to improve his bowling techniques. He was the one making T20I cricket debut with Naman Ojha and Virat Kohli and ODI cricket debut with Pankaj Singh and Ojha, and his Test cricket debut with Indian fast bowler Umesh Yadav. He holds the record of fastest Indian cricketer/bowler to reach 50,100 and 150, 200, 250 and 300 wickets in Test cricket. He is the 3rd Indian player winning the man of the match the award on his Test debut. He is the only bowler in cricket history to dismiss Kumar Sangakkara in 4 successive games. He received both the title of the ICC Test Cricketer of the Year and ICC Cricketer of the Year for 2016. He is the third Indian player winning Sir Garfield Sobers Trophy after legendary Rahul Dravid and Sachin Tendulkar. A lot of controversy was created after he Mankad Jos Butler in IPL 2019.